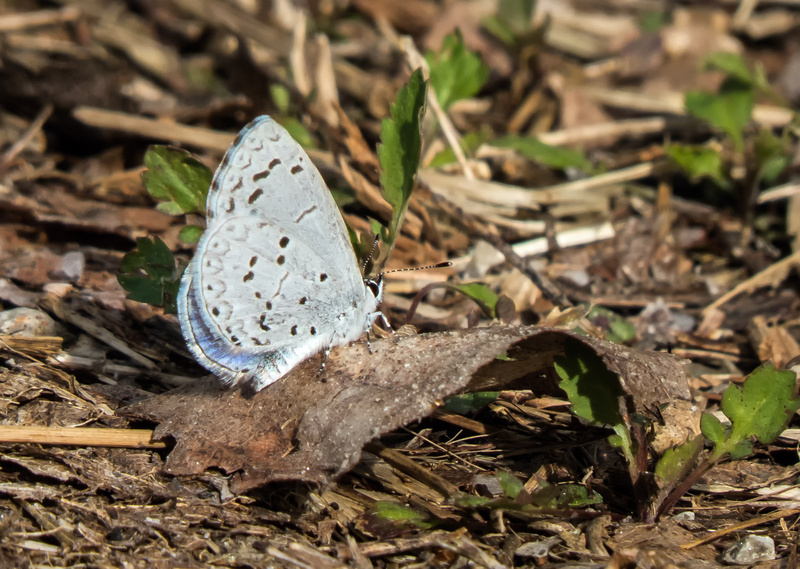 Insects are becoming more active now as the weather warms up a bit, like this tiny Spring Azure butterfly (Celastrina ladon) that I spotted yesterday at Occoquan Bay National Wildlife Refuge. There is something about chasing after a butterfly that makes me feel like a child again. I am sure that I would have looked ridiculous to an outside observer, who would have wondered what it the world I was doing. Try it yourself. Chase a butterfly today or, if you can’t find one, let go of your inhibitions and do something equally childlike, like coloring with crayons. I think that most of us take ourselves too seriously too often. Good advice, Mike. We all could lighten up a bit. I saw one of these yesterday. I was surprised and pleased! That is definitely cool. It looks like spring is gradually taking hold. Thanks, Diann. Whenever I happen to be in a store during back-to-school sales, I will often buy the 24 color box of Crayolas that is usually available–those crayons bring me right back to childhood memories. Nice Mike! Also Dragonflies will be back soon!! I am starting to look for them, but so far am coming up empty-handed.